On August 20, 2014, Ontario Nature flew me to Thunder Bay and over a period of three days I had the wonderful opportunity to share what I have learned with dozens of incredible people in Thunder Bay. Upon arrival I was very grateful that Amy from Ontario Nature was able to whisk me up to Mount McKay so that I could attend Raphael Moses’ second medicinal plant walk of the day. Raphael is Ojibwa and although his home is in Pic River, Ontario, he spends a lot of time traveling teaching people about how powerful plants are when used correctly as medicine. In fact, he started studying traditional medicines about 35 years ago and earlier this year he published a book on traditional medicines called Holistic Adventures. It was an incredible honour to not only attend his walk but to meet him. Raphael is very knowledgeable and he has a great sense of humour. That evening I was at Hillcrest High School Auditorium and gave a lecture about wild plants, their nutritional content and why we all need to have this knowledge. On Thursday I led two walks and one on Friday. The weather was great making the walks a great success. I want to send out a special thank-you to Julee, Lisa, Amy and Will at Ontario Nature for all their fabulous support and hard work organizing “Foraging Week “in Thunder Bay. Unfortunately I was unable to stay for Saturday’s event which was a fungi lecture and walk but I heard this was a great success as well. 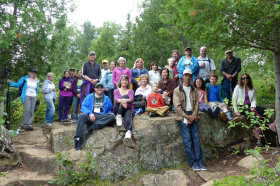 Well done Ontario Nature for organizing a terrific foraging week for all! The one thing that deeply touches me is when someone takes my passion and runs with it. Irene Warmenhoven attended two of my walks. Interestingly she was involved in planning a totally separate event two months prior; the event was a lecture and hands-on survival techniques based on what she learned from a trapper years prior. She was planning on talking about water, hypothermia and shelter. Irene learned enough about edible wild plants that she added this into her talk. 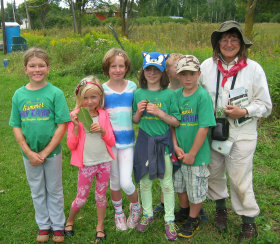 Irene is Thunder Bay’s Horticultural Society’s vice president and for this particular event she taught youth from 6 to 12 years of age about wild plants and the feedback from the youth was positive. For me, this is mission accomplished. When people take what I share and pass it along this is what it is all about. Hopefully these youth have shared what they learned with their family and friends. To everyone I met in Thunder Bay, thank you all for your kindness and smiling faces; those three days were very special for me. Be sure to watch my events page! Public walks will be posted there once I schedule them! Thank-you! Hi, I was just wondering where you would go to pick mushrooms in Thunder Bay? Hi Will – please email me and I can let you know where I found some when I was there last summer. I’ll be there next month – August 16-19. Be sure to stay tuned to Ontario Nature for dates and times of my walks. Hi I missed the walk again:( but know its that time of year fi r mushroom picking, I only know a few but was wondering if there is a group to join or any more walks this month or if we can make one, I think it would be a great way to be more involed in nature and good people, let me know of anything.